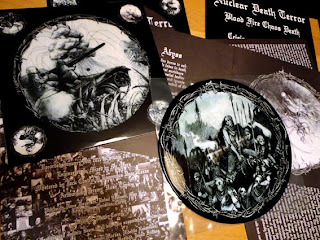 Nuclear Death Terror: Blood Fire Chaos Death 12" picture disc out now! Blood Fire Chaos Death 12" picture disc out now! NUCLEAR DEATH TERROR - Blood Fire Chaos Death. Four tracks of brutal d-beat crust with an '80s black/death aura. 12" picture disc with artwork from Jeremy 'Hush' Clark, limited to 666 copies WILL NOT BE REPRESSED. Recorded at Studio 246 in Osaka by Mr.Hara (Framtid, Gloom, Zouo engineer) and includes a 12-page LP sized book with artwork & lyrics. Single copies $22 AUD, 5+ copies $18. Australia: $35 (regular mail, approx price). World: $40 (seamail, approx price). Email razethestray(a)hotmail.com for ordering info.